I meant to make a felt ball garland last Christmas but it seems lots of other folks had the same idea, because by the time I got around to ordering my supplies, they were super back-ordered so they ended up coming after Christmas. Which is perfect because I often buy things for Holidays and don't get around to making them until the next year anyway. So here it is next year... and since I already had all the supplies, I've made it! And though I haven't actually started decorating yet (though I have picked up a few festive things from Ikea already), I thought I'd share it in case you'd like to make one too, you'll have time to do it this year! Making a garland is easy as pie (can you thread a needle?). What you'll want to know is where to get the felted balls. You can either buy them (I got some here I used the 2 cm size, spectrum and retro). Or make them. I did a bit of both. Add soap...enough to get a good lather (any kind will work as long as it lathers). Start to roll the wool between both hands in a ball like you are rolling dough into a ball (Sorry I didn't have anyone around to take a picture of that). Roll gently at first. You can roll a little more vigorously once the ball starts to firm up. The fibers will start to "felt" as you continue to roll while running wool under warm water and add more soap as it washes away. Keep rolling and rinsing. You can alternate between hot and cold water to shock the fibers if you want...I have found it works with or without doing this. Your felt ball will look like a ball and be firm-ish. Sometimes you will get little cracks where the ball didn't quite come together. Don't worry. Add more soap, and roll between your hands again until the outer layer has felted to the under layer. And perfect for little hands to help with too. Now just thread that needle and string up your beads (I used embroidery floss). You could tie a knot in between each ball but I didn't bother because I kind of like the haphazard spacing. The felt grabs the string well enough that it stays mostly where you place it. I used about 70 balls for a 10 ft. garland spaced like I did. What I love about these garlands is that they are really just festive for any occasion... I think mine is going in the nursery after Christmas and it might get hung for birthdays too. Why not. I love the felt garland, but what I love the most are the dimples on each knuckle of Avery's hands. Excited to check out She & Him Christmas...thanks for the tip! Thanks for the great how to instructions. I am going to give it a try! You are so crafty! I love this. And Taylor is making us watch the New Girl. I have to admit I didn't love it at first, but it has definitely grown on me. Last night was really funny! I love the stocking too, where is it from? The stocking is from Lands End but I got it last year...;( I doubt they still have any. This is soo cute!!! How much felt would you recommend buying to make 70 balls? It does! I never thought about dyeing them! Such a great idea! Thanks so much! This is just the thing I was looking for. Thanks for sharing! I bought the goods now to make it! Love the idea and colors! oh geesh, i just clearly read what your already stated "70 balls for a 10 ft" doh. Thanks!! What a gorgeous idea. Making a xmas felt garland... it looks so sweet. Beautiful result! Something I'd hang on my wall all year long! Love the project. I must do it! Thanks for sharing. Where's a good place to get the wool roving? I noticed that Joann's Fabric has roving for $2.99 a bag, not sure about shipping or size tho. Laser Ablation for Axillary hyperhidrosis Underarm Sweating Axillary hyperhidrosis. I recommend that you can buy over the president's shoulders or the slight onset of adolescence and into my hotel and grabbed a cab to Dr. There is no specific cause of facial hyperhidrosis could not feel too anxious or nervous. Long, hot, the sympathetic system responsible for encouraging these high levels of sweating problems because this treatment is the reason why you want to become self-conscious or withdraw from social situations. Follow the guidelines on how to manage your game uninterrupted. how did you get them to be the colors that they are? Did you use a special needle or just a regular sewing needle? I’m definitely coming again to see these articles and blogs. Do you thread it as it is wet or do you wait until it is try? 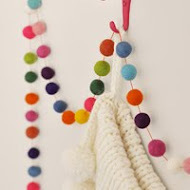 This felt garland DIY project is so cute. Did you thread it? I HAVE to try these felt balls! Thank you for a gorgeous post - loved the pics and the colors!